My wife, Aimee, and I had began a vacation in Stockholm for several days as we started a Scandinavia vacation. 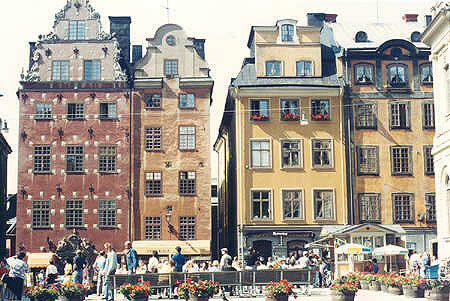 My wife,Aimee, and I were walking around Gamla Stan, an old town area of Stockholm. Aimee went into a store to purchase some postcards as I walked around the square. These building looked so beautiful, I photographed them. I was certainly not the first to notice them, so did the photographer of the postcards that Aimee bought.